Update: This Thursday and Friday, 21-22 February, you can get entry to the RPS's new home and its inaugural exhibition for free. The half-term offer is the perfect way of seeing this amazing space – as well as the 100 images that are on display. The show is open from 10-5pm on Thursday 21 February, and from 11-7pm on the Friday 22 February. The Royal Photographic Society is to open its new headquarters in Bristol on February 7. The four-floor building will mark a new beginning for the UK organisation that was first founded in 1853. For the past 40 years the RPS has been based in Bath, just 12 miles along the River Avon. 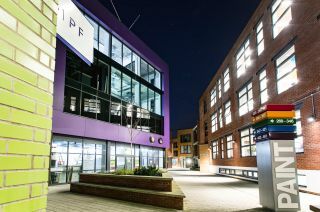 The new space has been purpose built in Paintworks in Bristol, which is already established as a creative quarter in the city. RPS House will be next door to the Martin Parr Foundation which opened its doors at Paintworks in 2017 – and will therefore establish Bristol as a hub for photography. The new building will house a 200 meter square exhibition space - offering the RPS's first permanent gallery since it moved from its Octagon galleries in the center of Bath to Fenton House back in 2003. The first exhibition will be the Society's International Print Exhibition, which is celebrating is 161st year. The center will also include a 102-seat auditorium, an educational facility, and office space for the organization's staff. RPS Chief Operating Officer Mike Taylor says: “Our building brings a public exhibition space back to The Royal Photographic Society for the first time since 2001, so that it can show the best of photography to inspire and excite the public. The building restates the RPS’s commitment to photography and reinforces its own place within the medium it has been integral to for the past 165 years". The RPS International Photography Exhibition will feature 54 exhibiting photographers. Catherine Hyland won the Gold Award in this competition with her series of portraits entitled Wait-And-See Pudding with Patience Sauce, for which she collects £1500. The Under 30s award went to Christopher Bethell for pictures from his series The Duke of Earl. The IPE 161 exhibition will be on display in Bristol from 7 February until 24 March. It will then go on tour visiting Birmingham, London, Hull and Dublin. The RPS House gallery will be open to the public from Thursday to Sundays, and is located at 337-340 Paintworks, Arnos Vale, Bristol, BS4 3AR.